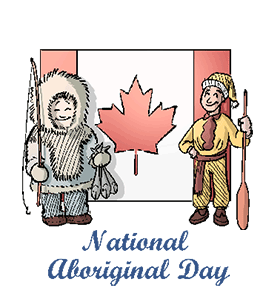 National Aboriginal Day serves to recognize the heritage, distinct cultures, exceptional achievements and contributions of Canada's aboriginal people and the role that they continue to play in the development of a harmonious multicultural nation. From the early 1500s till the late 1800s, European settlers and local aboriginals formed military alliances and clashed over commercial trade throughout colonial Canada. As the British rule came to an end in 1867, Canada began to pass numerous acts and treaties aimed at shifting land titles and restricting the lives of aboriginals. It wasn't until the second half of the 20th century that aboriginal rights movements began to gain momentum. For generations, June 21st has been a day on which aboriginal peoples have celebrated their culture and heritage so, in 1996, Canadian Governor General Romeo LeBlanc proclaimed that June 21st, the summer solstice, would be further known as National Aboriginal Day. The Canadian Constitution recognizes First Nations, Inuit and Metis people as Aboriginal peoples. According to the National Household Survey in 2011, 4.3% of the Canadian population identify with an Aboriginal identity. According Statistics Canada, in 2011, the largest number of aboriginal people lived in Ontario, however the largest share per population of aboriginals live in Nunavut. We owe the Aboriginal peoples a debt that is four centuries old. It is their turn to become full partners in developing an even greater Canada. And the reconciliation required may be less a matter of legal texts than of attitudes of the heart. - Governor General Romeo LeBlanc, February 1996. Attend a pow wow, an aboriginal social gathering, in your local area. Most are complete with aboriginal dancers, performances, storytelling, music and fun games for the kids. You can even attend the North America's largest and longest running Pow Wow in Wikwemikong, Ontario. Visit a Native Reserve. Many aboriginal reserves in Canada have cultural centres and tourist programs. It is best to contact the reserve of your choice in advance to be sure that they welcome visitors onto their land. Tour companies also provide trips onto reserves. Enjoy traditional aboriginal cuisine. Although it varies throughout the country due to topographical differences, some common items are: wild Sockeye salmon cooked over an open fire, buffalo burgers, candied salmon, Indian tacos, and fresh bannock with homemade berry jam.